Matt asked: Is there any meaningful difference in conversion or other metrics for companies in different ARR buckets? There are some variances across ARR buckets. 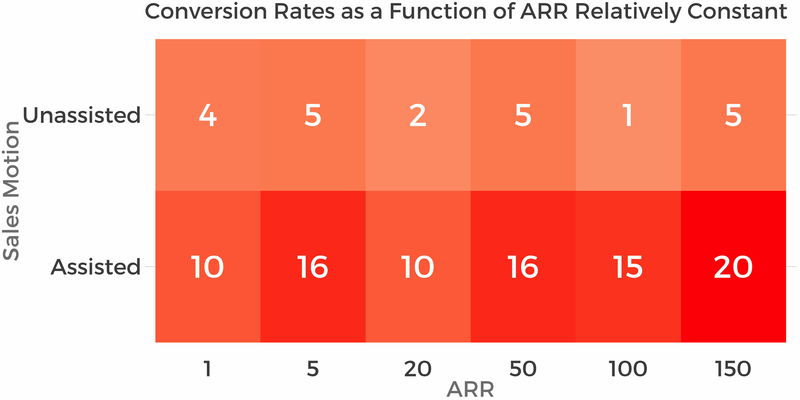 I would have expected companies in the $1M or less in ARR to observe lower conversion rates because they are earlier in their go-to-market development. Consequently, earlier startups might have a lower conversion baseline, whereas a business at $20M in ARR has spent several years optimizing trial. But statistical tests indicate that the differences in conversion rates aren’t meaningful. Jonathan asked: Can you share trial length by market segment? This was a good intuition. 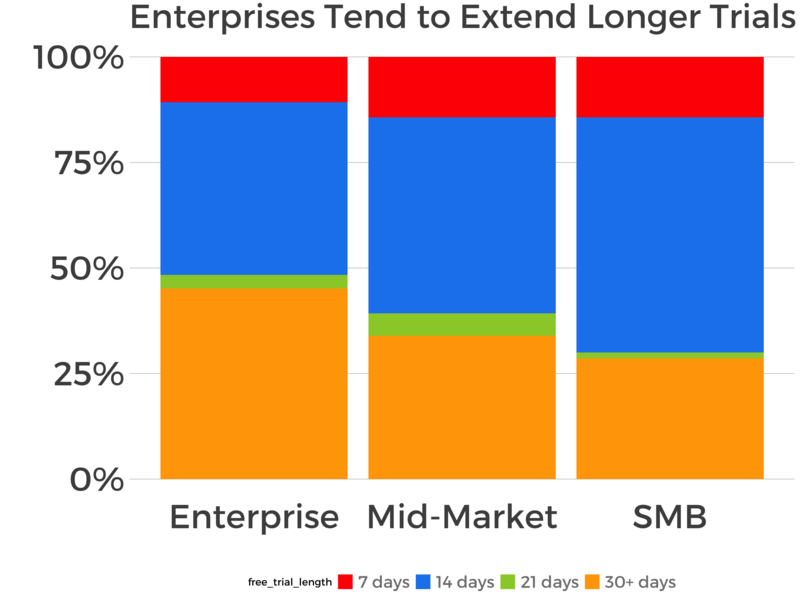 Enterprises tend to use longer free trials than their SMB counterparts. This may be due a perception that enterprise buyers navigate longer and more complex decision-making process. But the conversion rates across different trial lengths aren’t different to statistical significance. And can you show payment collected by ARR? 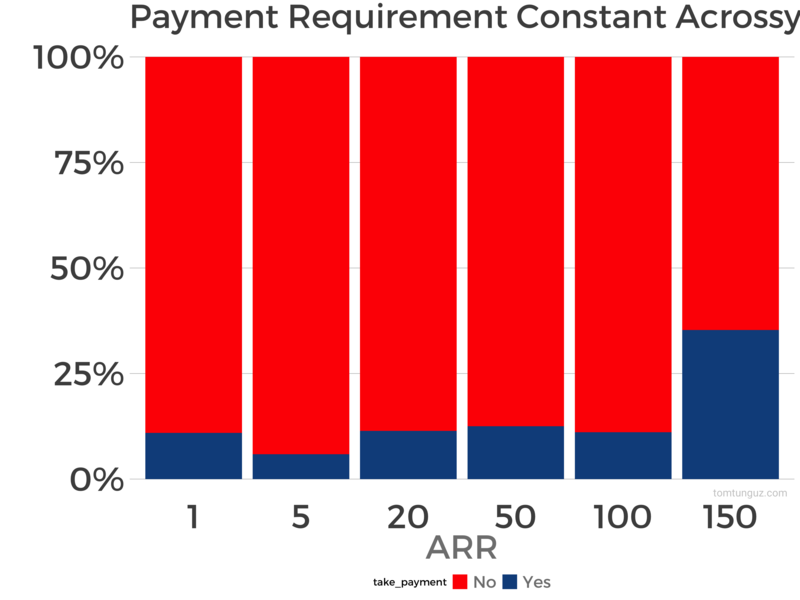 The popularity of requiring payment is constant across ARR buckets. The only one that stands out is the $150M ARR bucket, but there weren’t many of those in the respondent set, so the result is skewed by a small sample set. Jason asked: when you wrote “require payment to start trial,” does that mean collecting payment information or actually charging the card? I suspect the effect on the top of the funnel and the ultimate conversion rate is the same. But charging the card immediately would mean the trial wasn’t free! And if they did cancel the trial, you would have to credit accounts which could get tricky. Andrew asked: Does requiring payment have an impact on retention? And when is that conversion counted… is that on payment capture? Good question. We don’t have the data to answer it. Dustin asked: Was there any meaningful impact in combining free trial limiters? ie. a usage + time bound free trial model converting better than usage or time alone? We didn’t ask this in the survey, so I don’t have a good answer for this. Perhaps a useful question to ask in the future.